Nike, the official apparel company of the NFL, unveiled a new advertisement Monday featuring quarterback Colin Kaepernick to commemorate his willingness to "sacrifice everything" as part of its "Just Do It" campaign. "Believe in something, even if it means sacrificing everything. #JustDoIt," Kaepernick tweeted on Monday. The words are imposed over a close-up of his face, along with the iconic Nike swoosh. Nike announced Monday it had signed a new multi-year deal with the controversial player, who hasn't taken a snap since 2016. He's become one of the NFL's most famous players since he began sitting and then kneeling during the playing of the national anthem to protest racial injustice. Other players around the league have joined the protests in what's become a cultural flashpoint in the Donald Trump era. Kaepernick is suing NFL owners for what he alleges is collusion to keep him out of the league because of his protests. Despite his starting experience, which includes a trip to the Super Bowl, no rosters signed him as a free agent in 2017 or 2018. However, he also owns a paltry 3-16 record in his last 19 starts. Nike and the NFL announced in March an extension of their apparel deal through 2028, the New York Times reported. Kaepernick already had a deal with Nike dating to his entry into the league in 2011, but it's been extended. President Trump suggested last year that players who don't stand during the national anthem should be fired from their teams. There are still tensions heading into the 2018 season between NFL owners, players and their union representatives over how to handle the contentious debate that touches on free speech, patriotism and race. 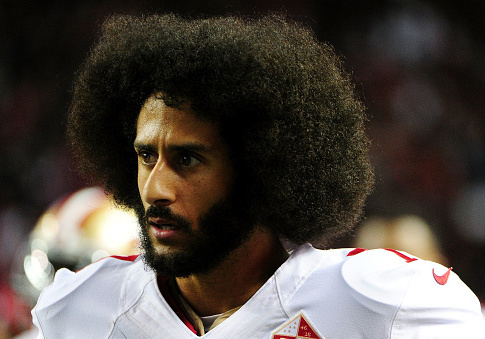 Kaepernick was a second-round draft pick by the 49ers in 2011. He took over the starting position from Alex Smith in the middle of the 2012 season and led the 49ers to a Super Bowl appearance. As the full-time starter in 2013, he led San Francisco to the NFC Championship again, where they fell to the Seattle Seahawks. He struggled with falling production and injury over the next three seasons as the 49ers went from an NFC powerhouse to one of the league's worst teams. Overall, his regular-season record as a starter is 28-30, with 72 touchdowns against only 30 interceptions for his career. He's also rushed for 2,300 yards and 13 touchdowns. This entry was posted in Culture and tagged Donald Trump, National Anthem. Bookmark the permalink.